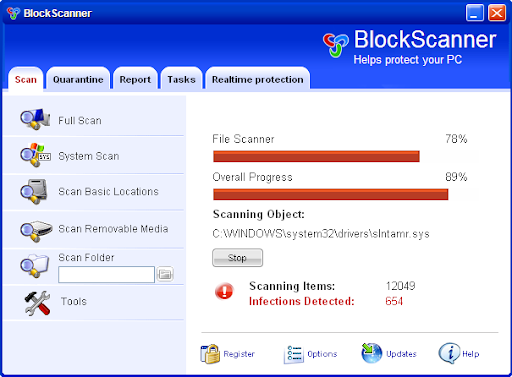 BlockScanner comes from fake online antivirus scanners or fake video codecs. It creates random files on the system and detects them as infected. It also display a lot of disturbing warning messages to scare users, pushing them to buy a license. If your PC is infected with BlockScanner, use MBAM to remove it. Security Central is a fake Antivirus tool. It is from the same rogue family as Home Personal Antivirus, XP Deluxe Protector, Win PC Antivirus, Win PC Defender, XP Police Antivirus, IE-Security, WinDefender 2009 and Total Secure 2009. 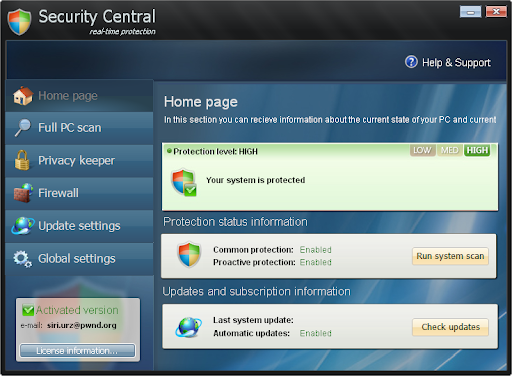 Once registered, Security Central doesn't detect infections anymore (same system, no cleanings). There is no more fake alerts and disturbing warning messages... Easy proof of a scareware application. If your PC is infected with Security Central, follow the BleepingComputer removal guide. 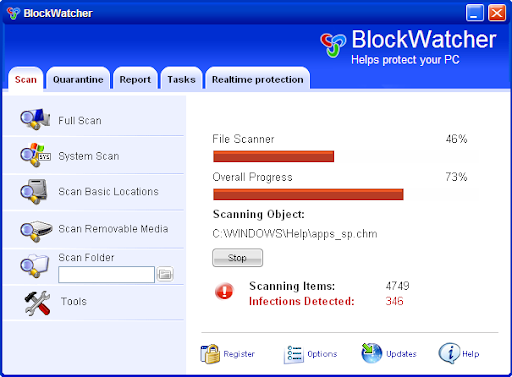 BlockWatcher creates random files on the system so it can detect them as infected items. If your PC is infected with BlockWatcher, follow the BleepingComputer removal guide. 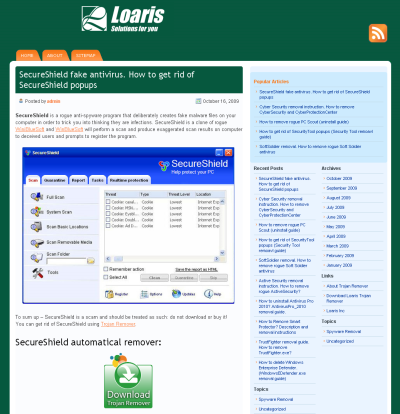 SoftBarrier creates random files on the system so it can detect them as infected items. If your system is infected with Soft Barrier, follow the BleepingComputer removal guide. Volcano Security Suite is a fake security software installed from fake online antivirus scanners. 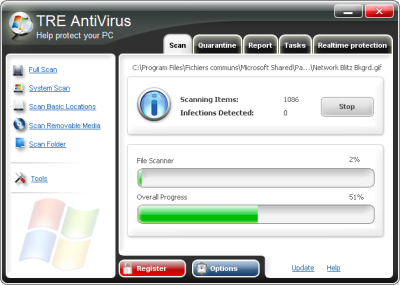 It replaces Smart Virus Eliminator rogue. Both are coming from a big family: Windows Entreprise Defender, Windows PC Defender, Windows Additional Guard, Windows Guard Pro, Ultimate System Guard, Smart Virus Eliminator, Windows Protection Suite, Windows System Suite, Windows Security Suite, Malware Destructor 2009, FastAntivirus, MalwareCatcher, VirusShield, Extra Antivirus, Virus Sweeper, Ultra Antivir 2009, Virusdoctor, VirusMelt, VirusAlarm. Usually, the new comer replaces the old one, but here, the latest rogues are in the wild simultaneously. 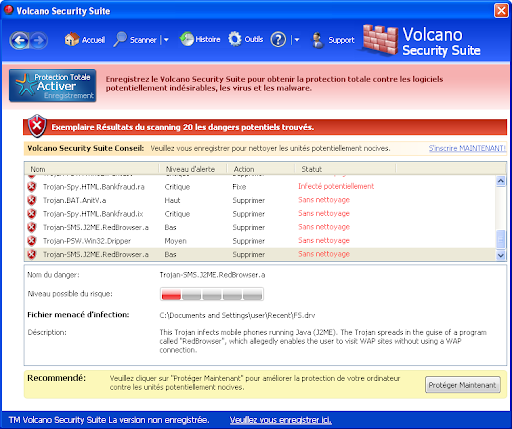 Volcano Security Suite displays false alerts and warning messages to scare users pushing them to purchase a full license. If your system is infected with Volcano Security Suite, follow the Bleeping Computer removal guide. SoftVeteran creates random files on the system so it can detect them as infected items. To remove Soft Veteran, follow the BleepingComputer removal guide. SoftCop creates random files on the system so it can detect them as infected items. To remove Soft Cop, follow the BleepingComputer removal guide. 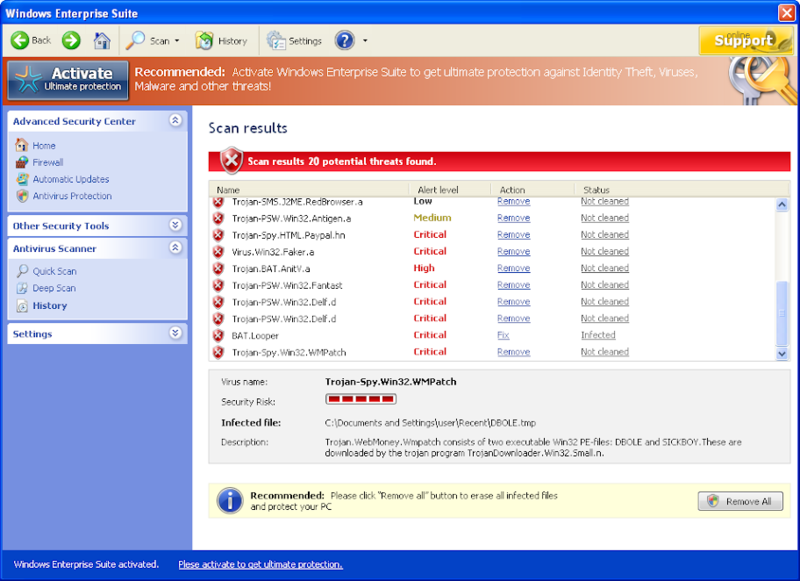 To remove TRE Antivirus, follow the BleepingComputer removal guide. The previous post: Secure Shield rogue was a test. Some blog webmasters are regularly using the screenshots I made on their blog post. They just take the pictures, wrote a text about the rogue dangerousness and link to a "Free Scan", "Free Removal" tool (which is NOT free). Without analyzing the rogue itself. 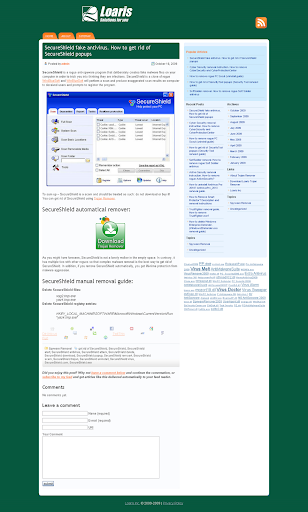 Some others blogs webmasters are promoting PUP softwares. Here again, PUP softwares creators don't analyze files. They try to sell their tools with a good google rank. So I decided to MAKE a picture of a new rogue that does NOT exist: Secure Shield. I post the picture and wait for the "serious" guys. 10 minutes after my blog and my digg post, Loaris posts a modified picture of mine (his digg). Loaris Trojan Remover was classified once as rogue. 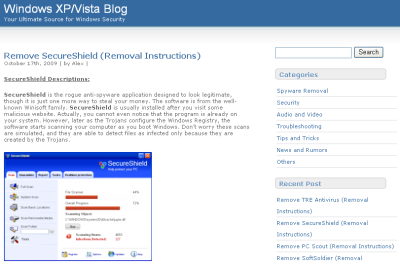 Few minutes later, another webmaster blogs about Secure Shield removal: Trojan Killer (a clone of Loaris Trojan Remover). Then it is PC Tools / Spyware Doctor affiliates turn to promise full removal of the rogue. Those guys are inventing files, folders and keys name. 3 days after, there is more posts about the Fake Trojan romover. 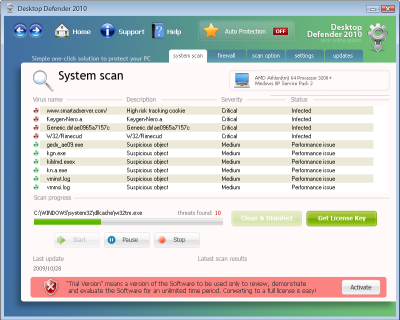 Spyware Doctor PC Tools affiliates copying others Spyware Doctor PC Tools affiliates posts. Users should not trust cleaners promoted by affiliates business plan. Click on the pictures to see the full capture of the blogs pages. The seed has germinate, you can search on google for more. Some of them manage to get removed from google (Loaris Trojan Remover delete his post about SecureShield). 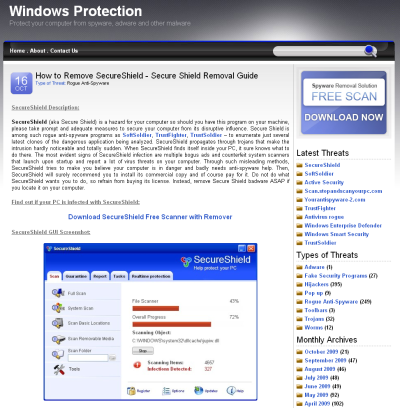 Secure Shield creates random files on the system so it can detect them as infected items.